The neuromuscular dentist understands the unique relationship between occlusion (bite), muscles and the temperomandibular joint (TMJ). The neuromuscular dentist is involved in the diagnosis and treatment of cranial facial pain, migraine headaches, TMJ dysfunction, and head and neck pain jaw disorders including popping, clicking and locking of the TMJ joint. 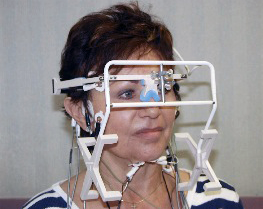 Treatment involves using myotronic K-7 equipment to determine what position your jaw is comfortable in when relaxed. The jaws are relaxed with a low frequency TENS unit that allows the dentist to determine the best jaw position. A neuromuscular bite is then taken at the proper jaw position. A laboratory technician then constructs an orthotic (occlusal guard) for the patient to wear. It is usual that after correcting the bite with a removable orthotic most if not all of the symptoms resolve. Sometimes physical therapy and/or chiropractics is indicated as adjunctive therapy to the orthotic. Once comfortable with the orthotic appliance a definitive treatment plan can be established which can include orthodontics, multiple crowns or bite adjustments.